Midlife: Beginning of the End or Beginning of Something New? It was an honor for “Write, Open, Act: An Intentional Life Planning Workbook” to be included in Laura M. Holson’s fine news analysis, “Forget a Fast Car. Creativity Is the New Midlife Crisis Cure,” in The New York Times. Human beings are tremendously creative and resilient, and creativity itself at any age can give us all sorts of new ideas and energy. It’s great for the heart and brain! Potter, designer and author Jonathan Adler, at a store opening here in Portland, told me how much he loves creating things—and the sheer exhilaration he feels in the process. One of the readers of an early draft of “Write, Open, Act” was author and counselor Norene Gonsiewski, who suggested I add a section for people 60+ who have accomplished so much but may not have considered what they want their life to look like. We’re living longer, which requires different planning. The whole notion of retirement is changing, and there’s tremendous opportunity as we enter life’s Third Act to be creative and even to invent a whole new life! There are many examples of famous people reinventing themselves at 60+. Laura Ingalls Wilder didn’t start the “Little House on the Prairie” series until she was 60. Jane Fonda totally reinvented herself as she approached 60; she writes, “Entered with intention, Third Acts allow us a second adult lifetime.” Fonda sees age as a time of potential—for wisdom, authenticity and wholeness. And just look at how her career has taken off since she entered her Third Act. That’s the power of writing things down and being intentional! Our friends Nancy and Mike Teskey are approaching 60 and have just quit their jobs, sold their house and most of their possessions, and are moving to Mozambique to work at an international school. 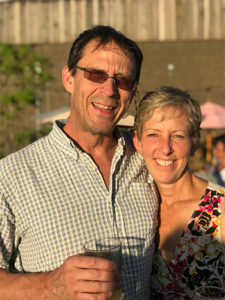 Mike was formerly the head of Alumni Initiates at Reed College, and Nancy headed the music program at Oregon Episcopal School. Nancy reflects, “While going through chemotherapy, I would get up every morning while it was still dark and have a cup of tea on the patio. I thought a lot about life and death. Each morning when the sun came up, I realized I had one more day and I should make the most of it. What is your life’s purpose now? Why are you here now? What are you missing? What are your values? What’s upcoming that may add to your life’s purpose? If you have one, two or three decades left, what’s most important to accomplish? How are you going to keep learning and growing? How will you keep your relationship fresh? If you’re single, do you like being single and want to remain so? What do you want your life’s purpose to be now? “Write, Open, Act: An Intentional Life Planning Workbook” and video tutorial (sold separately) are available at https://writeopenact.com.